Eeeeeee!! I LOVE IT SO MUCH!!!!! Our basement is loving it too. This big blank beige wall just got soooo much cooler. 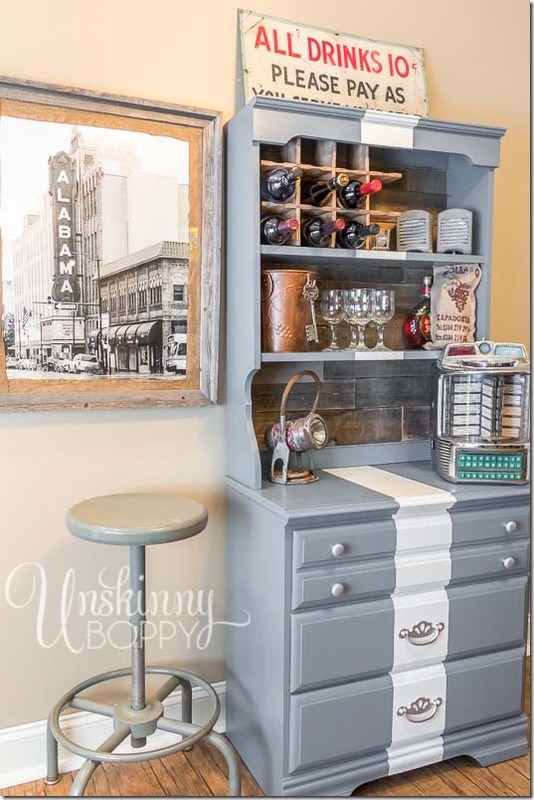 I cannot believe what a difference a little paint and some reclaimed wood made for this piece of furniture! 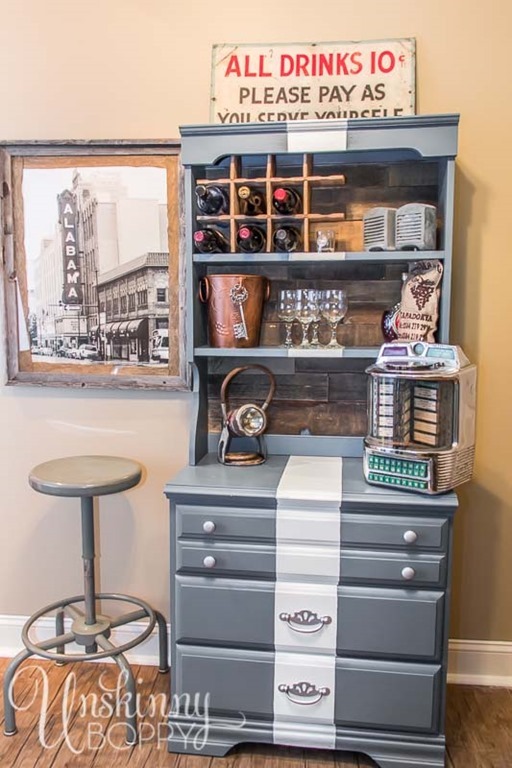 The white stripe down the middle came out exactly as I envisioned it in my head, and that reclaimed wood combined with that perfect French Grey-blue paint color??? I swoon. It is just gorgeous! This was THE perfect paint color for the space. 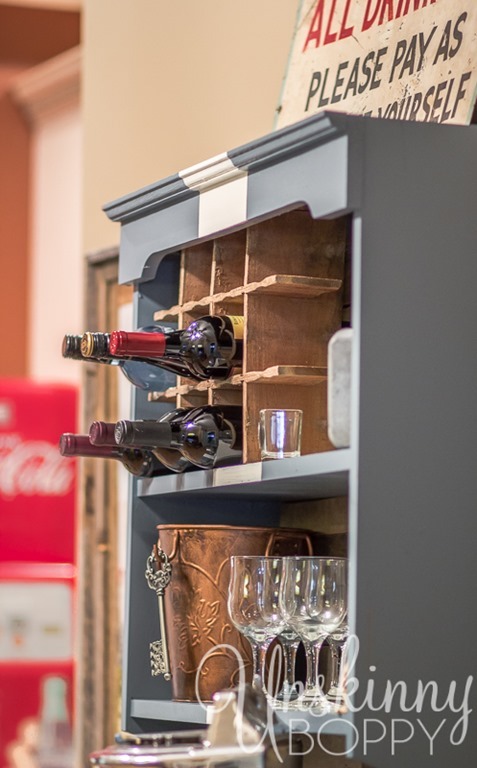 Since we don’t have a wine cellar, what better place to store some adult beverages than inside one of the leftover Coca-cola crates? I simply stood it on it’s side and braced it up against the lip of the upper shelf. It’s super sturdy, and holds six bottles of wine perfectly. 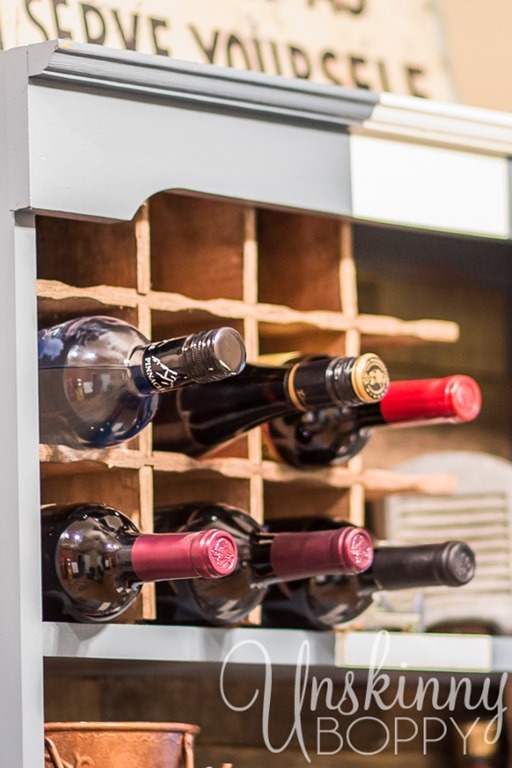 Add an ice bucket, a few glasses and a bottle opener, and we’ve got ourselves a party. Who wants to come over? 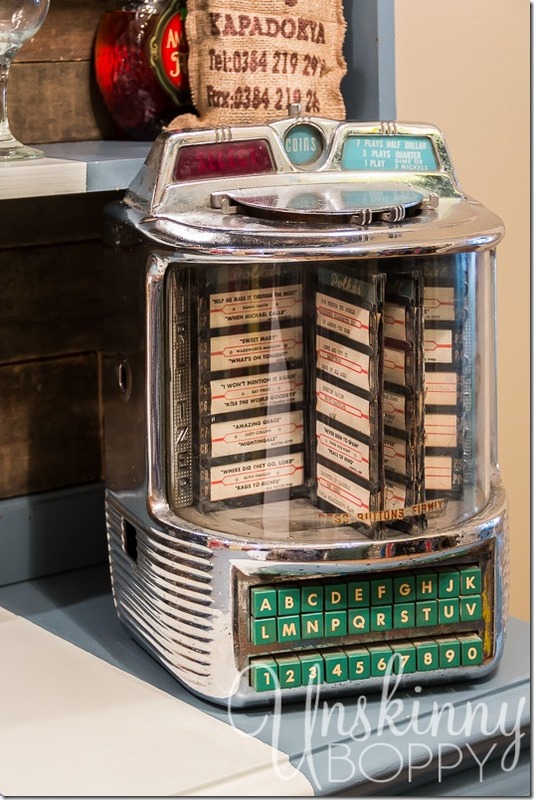 Anyone else remember these vintage mini- jukeboxes? I wish I knew the date of this one and the backstory behind it. What year could you get 7 plays for half dollar or 1 play for a dime or 2 nickels? So, there you go. The big reveal of my new favorite project! It took me all weekend, but it’s done! Now, if you’ll excuse me, I’m gonna go fix myself a drink and drop some nickels in this jukebox. I totally need to hear Sammi Smith belting out “Help Me Make it Through the Night” right about now. Before I go, I gotta say that I love this paint! It was so easy to work with and gave excellent coverage on my piece. I will totally be using this stuff again for future projects! Thanks, Glidden and MyColortopia, for all your help choosing it! Wow! That’s amazing; great job!! I love the addition on the wine storage. Thanks Dora! Have a great day! Do I love it? Uh huh. Did I pin it? You betcha. Do I love you for being such a 2010 blog commenting rockstar? Uh huh. Thanks Blissy! Thanks Terri! Glad to inspire you today! You rocked this project! Awesome makeover, I’ll be right over for a drink! I think this is just beautiful. So inspiring. I have the same chest and shelves in the same wood but it dates back to the 1960s. I am still using it in my jewelry studio. It could benefit from some TLC like this one did. Excellent idea! So glad I could inspire you today, LeAllyson! Goodness gracious, what a makeover! It’s so clever and beautiful too. 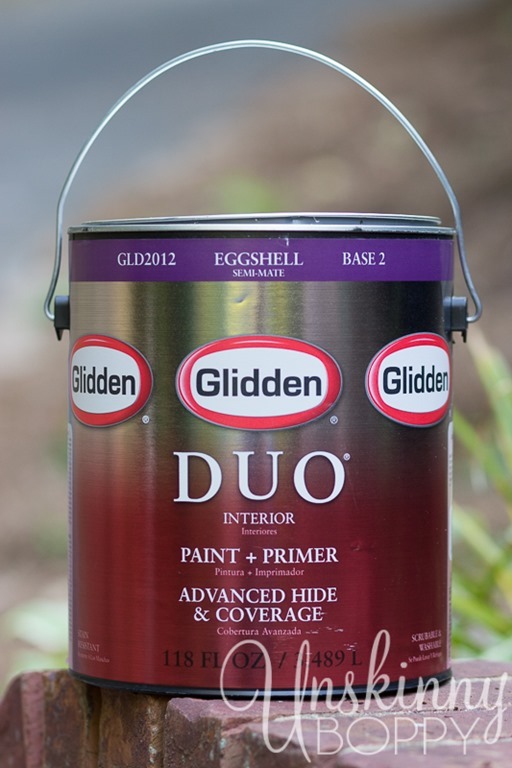 Glidden paint rocks– I’m digging that color. I’m in the middle of several room makeovers and I’m thinking that color would look amazing on my bookcase. Pinned that gorgeousness! Thanks so much Carrie!! It’s a great color! I’m coming right over! That’s beautiful! Where did you get the sign on top of the hutch? I love it! My husband found it at some junk dealer’s shop I’m sure. I found it laying inside my bathtub in my basement. My husband is like a squirrel- he buys things on Craigslist and I find them hidden all over the house. LOL! Oh my gosh!! I love it, well done! It looks awesome. Wow! 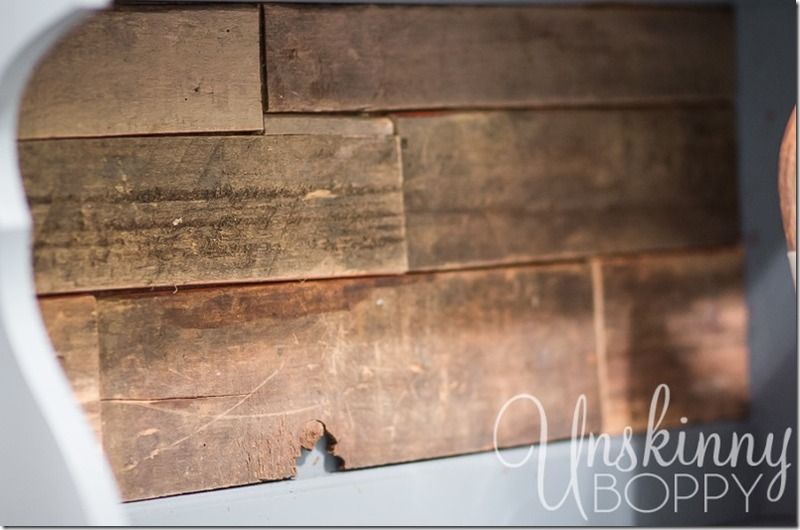 It really is amazing what paint will do … and reclaimed wood of course! What an awesome upgrade, if I had a basement I know it would be jealous! Bahahaha, we were totally on the same wine wavelength. Annnnd, I need that sign in my life. Stat. Come on over anytime, Kel. I’ll save you a seat at the Pac-Man machine. How fabulous is this. 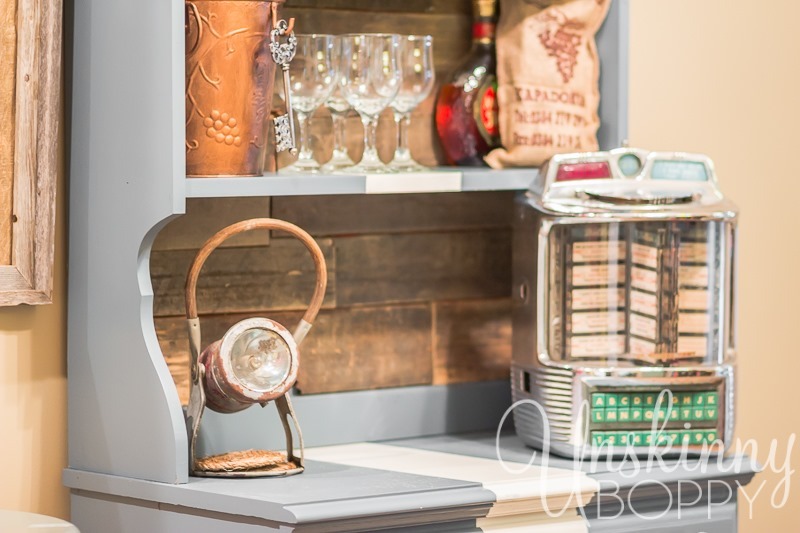 I love how it turned out and the juke box is wonderful. Looks amazing Beth!! 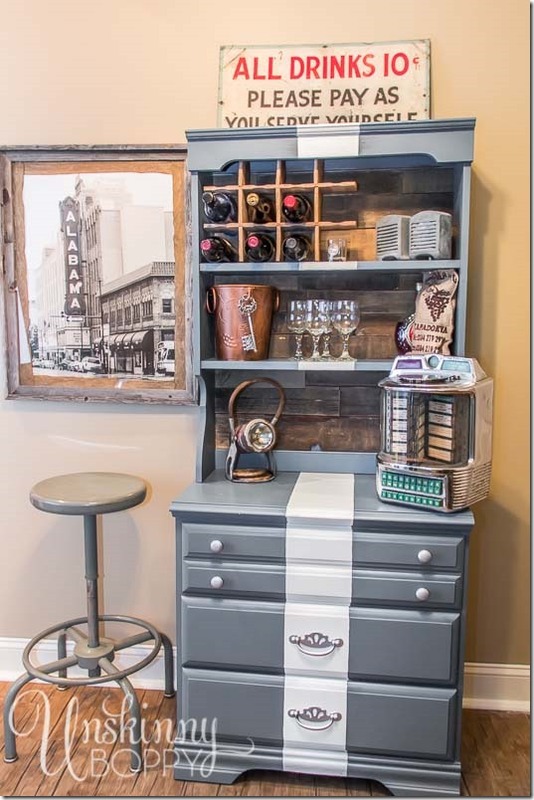 love the color choice and the white stripe. Fabulous storage solution too! 😀 Thanks for your sweet comments! My husband finds all sorts of vintage stuff at local junk honey holes and Craigslist. Who knows where it all comes from!! 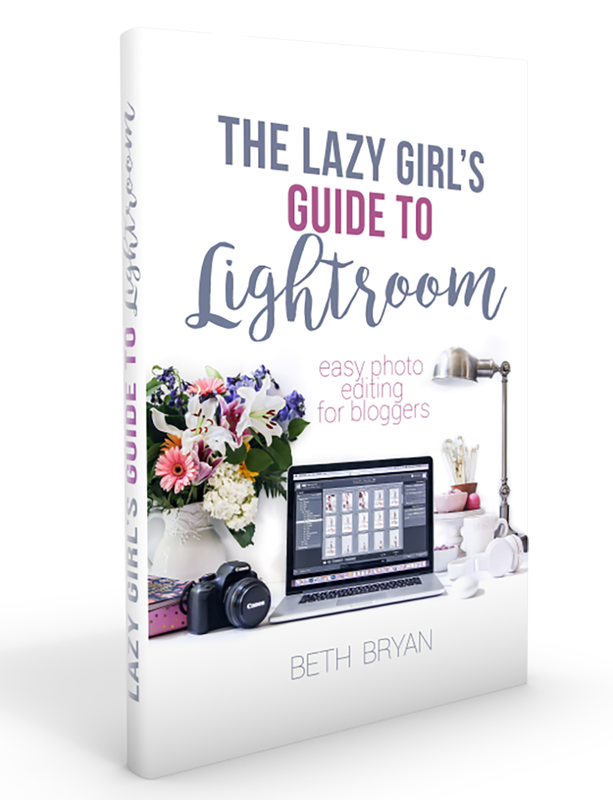 Beth, this is nothing short of amazing! I love all the touches, the styling and that reclaimed wood – swooning right along with you! I love this!! My daughter has the exact same piece in her room and I’ve been wanting to redo it. So inspired!! 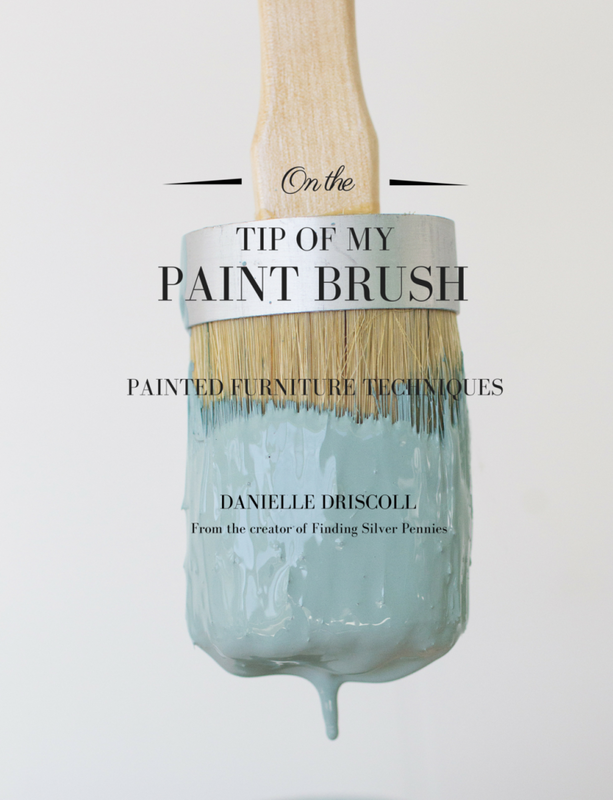 What type of prep work did you do to the piece or did you just repaint it? LOVE IT!!! BTW, I pinned it before I knew it was yours!! I see these “lovely” pieces all over the place and I usually walk right by. Next time I’ll think twice. Where did you get the vintage photo of the Alabama marquise? I grew up in Houston and it sure looks like the old Alabama Tyeater near River Oaks! Is it? Love the dry bar as well! I know it’s two years since your comment, but I love the picture you have up. I have searched for a photo like this but unable to find one. Do happen to know where you got it?